Location: At the lights, waiting for you. On Friday I had a piece made to replace my centre muffler. I now have the choice of centre muffler or straight through twin pipes. All that is needed to change between the 2 is to undo 6 bolts. The new twin pipes looks factory and as has been said before the sound is great. The new pipes cost $150.00 fitted and it took about 90mins to have them custom made. For those interested in having this done I highly recommend Mike Curtin and his team of experienced exhaust people at FASTFIT in Frankston, Victoria. Here is a link to the photo album with before and after shots as well as shots of the new exhaust piece being made. I hope this information is of use to anyone that is interested in this modification. Link Removed No Longer Works. are you getting any drone from the exhaust. do you have any before and after power figures. Immediately after having it done and driving away from the exhaust shop I did notice that the exhaust "seemed" to drone a little bit. I drove the family from Frankston to Calder and back to East Malvern, well over a 100km trip and neither the wife or kids complained about any drone. On the way home from the drags (Calder to East Malvern) it was like it hadn't been changed. There is a noticable burble on hard acceleration and on start up it has a great sound but I dont believe that there is any detremental drone. Regarding the power figures I had a dyno run at the Melbourne dyno day and got 200.9 RWKW. Since then I have added a second cold air intake, BMC panel filter and had the center muffler removed. I hope to be able to go back to the same dyno place (forget the name) and get an indication of any KW improvements. I have the capability to put the car back to standard (by replacing the center muffler, standard airfilter and taping up 2nd air intake), so if it isnt too expensive I would be able to give before and after rwkw figures for each mod and the mods as a total. I am not sure when or if this will happen though. do you think it is worth getting the filter done? Above is a link to how I did mine, after doing this coupled with a BMC panel filter I noticed a difference in car performance. I haven't got any dyno figures for it though so unsure exactly what the difference was. Do I think its worth getting done? Definately!!! Vik, would you consider your new system to "drone"? Do you think you will be able to live with the new modification everywhere? ie on highway, aorund town, surbubia etc? I thought about putting the two hotdogs in as well to keep the feds off my back...... but only if it increases performance over the standard system. ms700 what state are you in? If your in Melbourne I'll gladly meet you somewhere convienient for us both so you can have a look and listen. geea im the ACT! he he. If you dont mind, id like to have a look and listen at the Ford Tour, that's if you are bringing your T along. I am making the trek down to Geelong, I would really like to listen to the car and decide for sure! I look forward to showing you on the tour. It will be great to meet all the interstate "T" owners. This is how I did mine. Its in Melbourne but should be similar in other areas. I'm not sure that the warranty isn't affected either, you would probably need to talk to your dealer. The sound is awesome and I've had no negative feed back at all. I personally think its great too. Skeets, I think youll be happy, do the replaceable version and your safe,think about a hot dog for ADR complience. Expect to pay $200_$300 mark with two hot dogs. I live in Castle Hill Sydney. 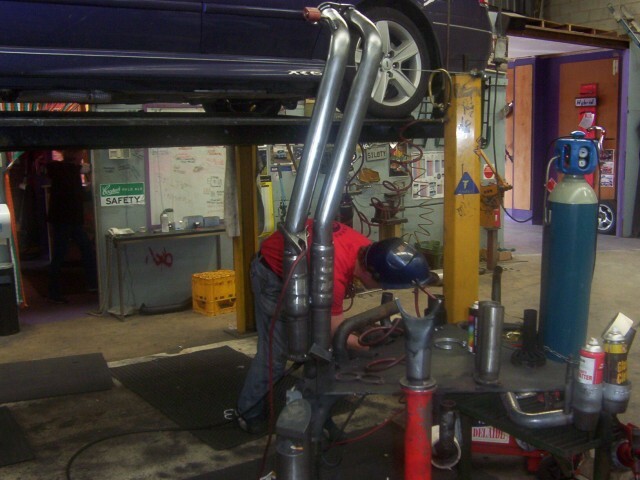 Has anyone had this done at an exhaust shop in the Hills or Blacktown areas? Cheers guys, the info's been great. 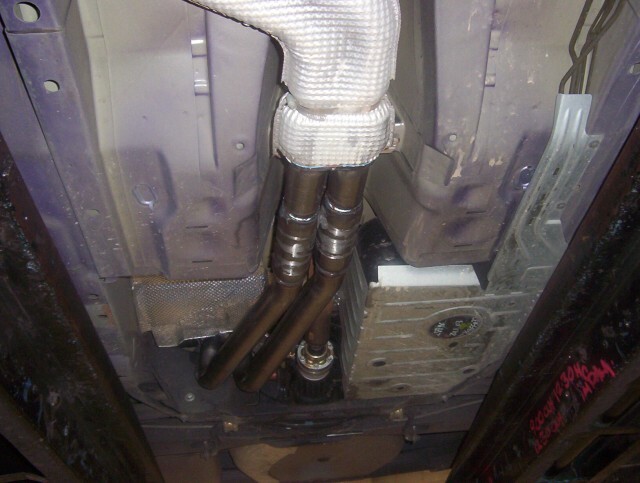 Removing your mufflers will not only effect your warranty but also create Back-pressure issues that we all hear so much about. camerooch, tell me more.I asked my service advisor and he looked into it and told me it was ok to remove it,no warranty probs,and not a mention about back pressure. So what do you know that we dont? If you affect the way the air enters the motor (like I did when I put my XR8 assembly on), or the way the air leaves the motor, warranty will not be honoured. But he also said it has a lot to do with the attitude of the car owner. I know what your saying ms, I asked my service advisor about the centre muff story when the zoom mag came out ( showed him the mag) he said no warranty - next breath warranty, at least he looked in to it I spose. I was always informed that warranty was affected if the component you altered had a direct effect on the component/s that failed. Obviously, what we need to ask is rather than "is my warranty void?" is something like, if my engine spits a piston, is it covered if the fault was a bad crank or something.... even though I have no centre muffler. Good question Devo maybe someone can answer it for us??? He was suggesting the Herrod V8 stainless system for use on my T - said that he'd already sold/fitted one, with a big improvement in exhaust note and slight increase in performance.